There are so many opportunities for businesses to collect data that getting a clear picture of all of it can be an uphill battle—and leveraging it for insight can be nearly impossible. But whether you are a start-up or a multinational conglomerate, not taking advantage of the available data is a mistake you cannot risk making. According to a 2016 McKinsey & Company study, over the past three years, digital leaders have achieved revenue growth five times greater, an operating margin profit eight times greater, and a return to shareholder value two times higher than laggards. Companies today need a closed loop system that combines data, insight, and action. 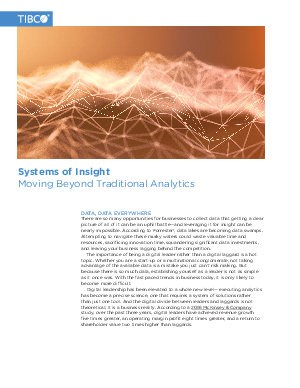 Download this paper to learn about the goals of a system of insight (SOI), the common set of technologies that all systems of insight need, and how an SOI can make a difference in your business.